Apple CEO Tim Cook this week talked about a “post-PC world.” Many people treated his comments as controversial, exaggerated or outright marketing lies. What he didn’t say — so I will — was that the transition from the PC world to the post-PC world involves a transition from a Microsoft world to an Apple world. For the past few decades, Windows has been the dominant platform and Mac OS has been a minority operating system. Here’s why their positions will be reversed in the years to come. The challenges faced by Microsoft, Apple, Google and all the other tech giants today are similar to those faced by companies in the past. In computing technology, the same patterns repeat themselves again and again. All successful technologies, platforms and paradigms follow the same pattern of emergence, acceptance, growth, dominance, decline, irrelevance and obsolescence. The emergence of companies is all about timing. Being the right company with the right founders and the right technology depends 100% on timing. What’s right today would have been too early a year ago and too late a year from now. Companies like Microsoft and Google are formed within a specific context that enables them to flourish. Had Google been founded when Microsoft started, it would have failed. Had Microsoft started when Google had, it would have never gotten off the ground. Once companies launch and become successful, the only way to maintain their success is re-invention. As the conditions that enabled their initial success fade into history, they have to remake themselves into a new kind of company. This is so hard to do that very few companies actually achieve it. The reason is that you often have to kill your most successful products while they’re still successful in order to take a gamble on the products that aren’t making big bucks yet. Apple managed to skirt this problem. The whole iOS forest was started with a tiny seed: The iPod. The iPod in no way overlapped with or competed against Apple’s main business, which was integrated PCs. Apple leveraged the iPod and iTunes universe to launch the iPhone, which they used to launch the iPad. By the time the iOS devices were competing against Apple’s Macs as an alternative for users, they were already bringing in more revenue for Apple. It will be easy for Apple to “sunset” Macs, to put them on the back burner and focus on iOS devices, because iOS devices are already the core business. The right thing to do for Microsoft would have been something like iOS — a single, light multi-touch operating system that spans from wristwatches to tablets that in no way is compatible with, shares code with or is in any way the same as Windows. And Microsoft came oh, so close. Their Windows Phone operating system would have been an ideal platform from which to challenge Apple for the future of consumer computing. Specifically, Microsoft should have aggressively pushed Windows Phone as the tablet operating system. They should have practically given it away to third-party hardware makers, and pushed those OEMs to develop sophisticated, high-quality tablets at low cost — and make them so compelling that millions of people wanted to use these devices instead of buying Windows PCs. But they just couldn’t do it. Instead, they made the mistake of the millennium (so far): Instead of starting “lite” and growing up, they started “heavy” and dumbed down. This is *exactly* what killed the Tablet PC. That platform was just Windows with yet another layer of spaghetti code that enabled people willing to pay $2,000 for a heavy, clunky Windows machine halfway retro-fitted for a stylus to buy a tablet. 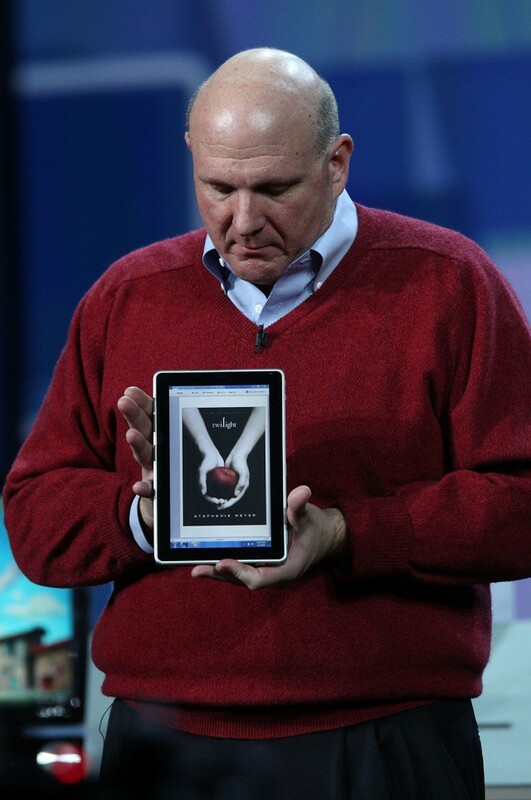 That Windows Phone should have been Microsoft’s tablet OS could not be more obvious. But dinosaurs have almost never been able to act in their future best interest when it conflicts with their present best interest. The touch-tablet revolution offers Microsoft two conflicting opportunities. First, they could seize the opportunity to succeed in the future by approximating the Apple model — start small and light and wait for Moore’s law to grow your low-cost, simple appliances into systems that function as the core of consumers’ computing experience. Or, second, they could use the excitement around tablets to squeeze even more revenue out of the aging Windows operating system. They chose the latter. And that’s why they’ll fail. Microsoft has always believed that simplicity is a parlor trick, that it’s achieved by slapping an interface that looks and feels simple on top of a functionally complex, architecturally complex and technologically complex base. Actual simplicity can be achieved only by starting over, by abandoning backward compatibility. That abandonment is what makes both iOS and Windows Phone, for that matter, so nice to use. It’s the failure to abandon backward compatibility that will make Windows 8 so unpleasant to use. And the superficial Metro UI doesn’t change that. So as the world gravitates to multi-touch post-PC devices, Apple’s big screen option will represent a fresh start while Microsoft’s will be carrying two decades of baggage. The bottom line is that Microsoft itself will be responsible for its coming decline. The company is constitutionally unable to offer a real competitor to its cash-cow Windows operating system. As we rush toward a post-PC computing era, Microsoft won’t offer a true post-PC alternative. But Apple will.